Everything was amazing , staff was super friendly. Place was clean and all the amenities were top notch. Would definitely stay here again. 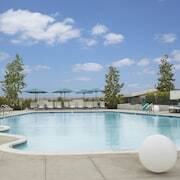 Gorgeous studio apartments minutes from Hollywood Blvd. Super friendly staff and they accept pets! The place was accommodating but noise was an issue with paper thin walls. Loved the breakfast, the room was spacious and very functional for a family. Property undergoing renovation so the front desk area is rather small and the entrance is judt a regular door. If you’re looking for a holiday destination where you can choose from beautiful beaches, celebrity-studded parties, and scenic hikes, you have stumbled onto the right spot. When you book one of our Los Angeles holiday rentals, you will find plenty of entertainment and excitement at your fingertips, whether it’s eating at some of the chicest restaurants in the country, hobnobbing with Hollywood elite, or cruising around Malibu on a bright, sunny day. Our holiday rentals in Los Angeles mean you don’t have to share your holiday with a crowded hotel full of guests—you actually get to enjoy your own private apartment or home. Short-term apartment rentals in Los Angeles provide an oasis you may never want to leave, but there is plenty for you to see and do around town. Why not wander down to the Hollywood Walk of Fame to count all the stars who have been honored over the years? Next, visit Griffith Park; it offers an amazing place to catch a sunset and take in the sweeping, panoramic views of the whole city. If you’d rather explore your creativity, the Getty Center is the place to go to check out world-class art exhibits; for a taste of the local artsy/hipster scene, head over to the Silver Lake neighborhood to check out some of the cool speakeasies, cafes, and taco joints lining the main strip. This holiday is yours to enjoy, so carve out some space for yourself by booking your holiday rentals in Los Angeles, USA on Expedia. It’s simple and safe, and you can find amazing properties with the click of a button. Search for a property that suits your needs, pick your dates, and see the rates. If it’s to your liking, make a secure booking through our site. We facilitate easy communication with property owners and can help you get in touch to make special arrangements. All you have to do is pack your bags and turn up to Los Angeles, ready to paint the town.